Ghosts living and dead, have always lived in Dragsholm Castle in Zealand, Denmark. They all leave historical footprings and they all tell their stories. Many of the ghosts at Dragsholm Slot- Castle- are as historic as the castle and even its name, Dragsholm, is historical. A draught or drag means a small stretch of land and in the Viking Age, a drag meant a narrow stretch of land that ships could be dragged across. Dragging the ships enabled sailors to avoid the dangerous waters north of Zealand. Dragsholm Castle is built on an island, so Dragsholm means the islet by the drag. When Peder Sunesen, the Bishop of Roskilde, built Dragsholm Castle on the Danish island of Zealand in the Twelfth Century, he probably didn’t intend for it to be one of Europe’s most haunted castles. He had simply imagined the castle as a residence for nobles and kings and his vision came true during his lifetime. In the Middle Ages, Dragsholm Castle served as a fortification and a residence for nobles. While the Count’s War which paved the way for the Reformation in Denmark, raged from 1534-1536, Dragsholm was the only castle on Zealand that withstood the armies of Count Christoffer who supported the Catholic King Christian II until the election of Christian III deposed him. After the Protestant Reformation, Dragsholm passed into the hands of King Christian III and over the next 128 years, from 1536 to about 1664, it was used as a prison for noble and ecclesiastical prisoners. The prisoners were assigned to cells custom built to fit their crimes, actions, and nature of their behavior toward the King. Joachim Ronnow, the former owner of the castle and last Catholic Bishop in Roskilde, and James Hepburn, 4th Earl of Bothwell and third husband of Mary, Queen of Scots, were prisoners in Dragsholm during this period. The mad squire, Ejler Brockenhuus, was also imprisoned in one of the cells. When the armies of Charles X Gustav of Sweden invaded Zealand, Dragsholm’s defenders attempted to blow it up. The castle lay in ruins until King Christian V gave it to the grocer Heinrich Muller as part of his outstanding debts and the grocer began to restore the castle. In 1694, nobleman Frederik Christian Adeler bought Dragsholm and rebuilt it as a baroque castle. Several owners from the Adeler family, including G.F. O. Zytphen Adeler, who drained the Lammefjord, an arm of the North Sea, made radical changes to Dragsholm and its grounds. In 1932, the Adeler family died out and Denmark’s Central Land Board became the owner of Dragsholm Castle. In 1939, the Central Land Board sold Dragsholm Castle to J.F. Bottger, but only included the land belonging to the main estate. The Bottger family preserved the Baroque style of the castle, but extensively restored and modernized the interior. The Twenty First Century Dragsholm Castle features two restaurants, conference rooms, a hotel, and reportedly 100 ghosts! The historical facts of Dragsholm and the ghostly facts are intermingled. The historical fact is that King Christian III decreed Denmark a Lutheran state in October of 1536, and he and most Danes forced monasteries, abbeys, church schools and cathedrals to renounce traditional Catholic beliefs for Lutheran practices. Joachim Ronnow, the last Catholic Bishop of Roskilde was supposedly imprisoned in Dragsholm Castle in 1536. Some sources say that after a period of imprisonment in Dragsholm, Bishop Ronnow's Protestant captors moved him to Copenhagen Castle where he died in 1544. In modern accounts, he is rarely mentioned as one of the approximately 100 ghosts that supposedly haunt Dragsholm Castle, but if ghosts follow patterns of logic, it would be logical for him to haunt his last home and the place where his captivity began. After all, certain cells for ecclesiastical prisoners had been built in Dragsholm’s tower. Visitors to Dragsholm have heard moaning in the tower and the sound of presumably Catholic chanting. James Hepburn, the 4th Earl of Bothwell, and third husband of Mary, Queen of Scots, died at Dragsholm. After he was captured in Norway in 1573, King Frederik II of Denmark imprisoned him at Dragsholm. Legend said that his captors gave him just enough food and water to keep him alive, tied him to a pillar, and left him to die. It is said that he went mad and he died in 1576 or 1578. Visitors to Dragsholm have seen the Earl of Bothwell riding into the courtyard of the castle in his horse and carriage and many visitors have heard the hooves of horses beating on the cobbled yard. It is unclear whether Ejler Brockenhuus, called the “Mad Squire,” went mad before or after his imprisonment. It is also unclear which branch of the noble Danish Brockenhuus family he belonged to. The family began in Denmark with Oluf Brockenhuus, fought in the wars with Sweden and Norway and expanded into a Norwegian branch. The family genealogy mentions an Eight Brockenhuus and an Eiler Borckenhuus. Is is possible that the Mad Squire, too, was chained in the dungeon and his groans float up the stairs to the ears of modern hotel guests? 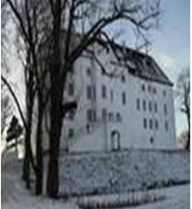 One of the more popular ghosts at Dragsholm Castle is called the White Lady. Many accounts say that her name was Celina Bovles and that she was a daughter of the Bovles family of nobles. Celina fell in love with a commoner who worked at the castle and became pregnant by him. Her father discovered what she and her lover had done, and he imprisoned her in one of the castle’s dungeons. In what appears to be a corroboration of the story, in the 1930s, workmen repairing the plumbing at Dragsholm discovered a skeleton wearing a white dress imprisoned in a wall. Eyewitnesses say that at night the White Lady walks about the castle looking for her lover and occasionally moans in sorrow because she hasn’t yet found him. The Gray Lady was a fair maiden who worked at Dragsholm. One day she arrived at work with a painful toothache and the master of the castle gave her a poultice that cured it. Shortly after the master of the castle cured her toothache, the maiden died, but her grateful spirit survived. She haunts the halls of Dragsholm eternally looking to perform good deeds to show the master her gratitude for his good deed. Luckily for mere mortals, not all of the purported 100 of the Dragsholm ghosts appear at once. They seem to take turns with the White Lady, the Gray Lady, and the Earl of Bothwell visiting the most frequently.